The 2015 Canadian federal election (formally the 42nd Canadian general election) was held on October 19, 2015, to elect members to the House of Commons of the 42nd Canadian Parliament and the Prime Minister of Canada. 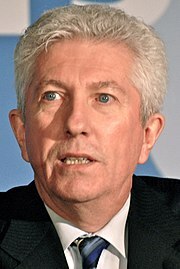 The 2015 election were issued by Governor General David Johnston on August 4. The election was one of the longest in Canadian history. It was also the first time since the 1979 election that a Prime Minister attempted to remain in office into a fourth consecutive Parliament and the first time since the 1980 election that someone attempted to win a fourth term of any kind as Prime Minister. The Liberal Party, led by Justin Trudeau, won 184 seats, allowing it to form a majority government with Trudeau becoming the next Prime Minister. Trudeau was sworn in on November 4, 2015. ↑ Zurcher, Anthony (20 October 2015). "Trudeau brings Liberals back on top". BBC News. Retrieved 22 October 2015. ↑ Patricia Treble. "When does Justin Trudeau become prime minister?". Macleans.ca. Retrieved October 28, 2015. This page was last changed on 16 September 2018, at 06:22.